To hold your reservation, we will need your credit card information at the time of booking. We will charge this card for you first night’s stay 7 days before the start of your reservation. You can cancel free of charge until 7 days before your arrival. You will be charged for the first night if you cancel in the 7 days before arrival. If you don’t cancel your reservation, you will be charged the total price of your reservation. We cannot make changes to a reservation within 24 hours of the start of the reservation. The full cost of the reservation is due at check-in. If you made your reservation through an online agent/website (Expedia, Hotels.com, Travelocity, Booking.com, BedandBreakfast.com etc.) your reservation is subject to their cancellation policies, and you will need to contact that booking company directly to cancel. We cannot make changes or offer refunds for any reservations that are not booked with us directly, either through our website or by phone. Check-in time is 3:00 p.m. or later. If you require an earlier check-in, please ask and we will look at our schedule to see if we can accommodate an earlier time. If you plan to arrive after 9:00 p.m., please let us know. We can give you the access code for the front door and leave out a welcome letter with self check-in instructions. We are available for any questions by phone or text, 24/7 at 413-801-3444. Check-out is 11:00 a.m.
Full breakfast is included in the room rate and served daily from 8:30 a.m. to 9:30 a.m. We can accommodate most special dietary restrictions, but please let us know in advance by calling or emailing us at least 48 hours prior to your stay. The history of Old Mill site in Hatfield is as old as the first settlements of the Connecticut River Valley in Western Massachusetts. 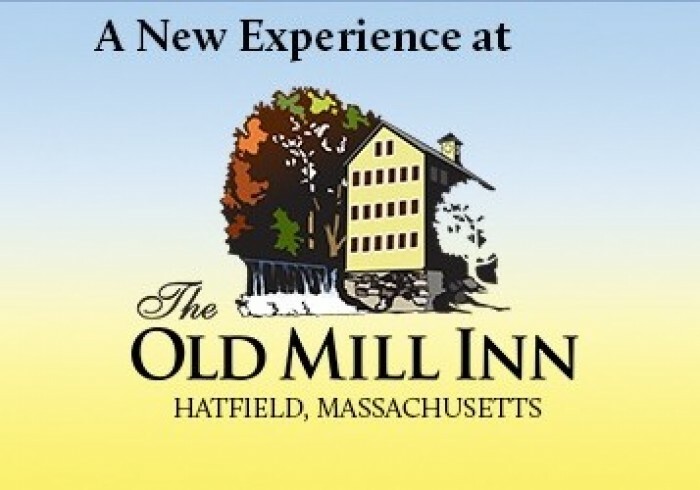 Converted in 2006 The Old Mill Inn bed and breakfast, now under new ownership, welcomes its guests with comfortable lodging, excellent breakfasts and tranquil surroundings. Address 1: 87 School St.